Steven (Chicagoland, United States) on 1 August 2011 in Animal & Insect and Portfolio. Taking a break from showing Las Vegas as I get caught up on photos taken this past spring. 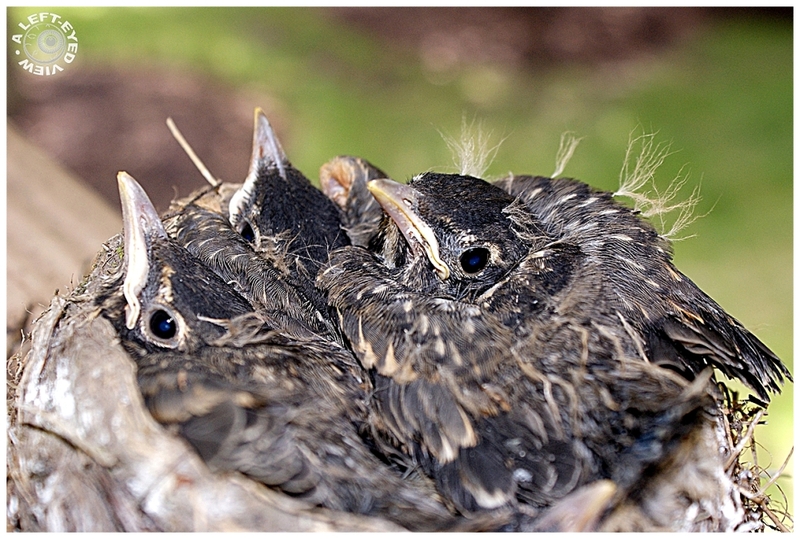 Here's a nest of baby robins. Looks a bit crowded in there. Photo captured May 27, 2011. Don't quite know how you got in there with a 50mm, but you came away with a cracking good shot. National Geographic Magazine worthy ! and you had to shoot it upside-down with your damaged Sony, haven't you? @Roman: I may have. I can't remember. Thankfully there aren't too many more photos to post with the Sony. The rest will be with the new Nikon D7000. What a wonderful moment to share . . they will need to move out fairly soon by the looks of it ! Great capture of this snug little nest! Amazing close up! They are so cute! Great capture! Oh my, that's one full nest. This is a superb shot, Steven - well done! Super cute and a very nice close up! Looks like they were getting ready to fly. A fine shot of this nest full.